The recession slowed the economy in many parts of the United States, but Houston, Texas, boasts a job growth rate of 11.7%, compared to an average 1.2% nationally, according to Newsweek (November 15, 2010). The city’s 160 life science companies account for some of that growth. Innovations from local medical centers and universities spawn biotechnology startups. The Texas Medical Center, considered one of the world’s largest medical complexes, includes the University of Texas Health Science Center, Baylor College of Medicine, University of Houston, Texas Heart Institute, and M.D. Anderson Cancer Center. Nearby Rice University pioneered nanotechnology, and two of its researchers received the 1996 Nobel Prize in chemistry for discovering buckminsterfullerenes, the building blocks of nanotechnology. Fledgling life science companies are aided by the state’s $200 million Texas Emerging Technology Fund, set up to speed innovation and commercialize research. “The funds help companies cross the valley of death,” says Deborah Mansfield, director of the life sciences program at the Houston Technology Center, a nonprofit business accelerator. The “valley of death” refers to the years after basic research identifies a promising technology, but the discovery needs validation to attract venture capital. Numerous examples exist that demonstrate that Houston’s strong scientific and business climate is helping to advance numerous startups. NanoSpectra Biosciences was formed in 2002 to advance the discovery of gold nanoparticles that absorb near-infrared light and destroy solid tumors. The gold nanoparticles are sized so that they naturally accumulate in the leaky vasculature of tumors, but not healthy tissues. The AuroLase® Therapy is infused into the bloodstream of patients with solid tumors then 12 to 36 hours later, the tumor is zapped with a near-infrared laser. The gold nanoparticles convert the light to heat, killing 90% of tumor cells. AuroLase Therapy “is ideal for tumors that have irregular borders or are near critical structures,” says Don Payne, president and CEO. AuroLase is in clinical testing for head-and-neck tumors, and a trial in prostate cancer will start this year. By targeting only tumor cells in the prostate, the treatment should eliminate common side effects of incontinence and erectile dysfunction. Brain and lung cancer also are prime candidates for AuroLase Therapy, which is reportedly synergistic with radiation and chemotherapy. Lone Star Heart uses proteins and small molecule drugs to stimulate the repair of damaged heart tissue. Co-founder Robert Schwartz, director of stem cell engineering at the Texas Heart Institute, discovered that two proteins act in tandem to convert normal human fibroblasts into myocytes. “They do it reproducibly over and over by activating cardiac progenitor cells,” he says. The proteins are being made recombinantly in bacteria; then they will be tested for their ability to regenerate damaged heart tissue in pigs. If successful, the company will file an IND application. Other co-founders, Eric Olson and Jay Schneider at the University of Texas Southwestern Medical Center in Dallas, discovered that the drug isoxasole activates different genes in pericardial cells to promote tissue growth. The company’s goal is to find new combination therapies to regenerate human heart cells damaged by heart attacks and other diseases. NSAIDs are in the pipeline at PLx Pharma. Rather than discover new NSAIDs, the company combines the phospholipid lecithin, derived from soybeans, with over-the-counter aspirin, ibuprofen, and naproxen to reduce the risk of gastrointestinal toxicity. Lenard Lichtenberger, Ph.D., professor of integrative biology and pharmacology at the University of Texas Health Science Center and the company’s CSO, created the process. He discovered that phospholipids naturally protect stomach lining from acid damage, but NSAIDs perturb the natural phospholipid barrier and allow stomach acid to cause injury. “Our approach was to find something similar to native phospholipids that allows aspirin to move through cell membranes easily, yet preserves the protective barrier,” says Ron Zimmerman, president and CEO. A study in the November 16, 2010 issue of the American Journal of Gastroenterology showed that in healthy middle-age people taking 325 milligrams of aspirin daily, PLx’ formulation reduced ulcerative damage to the gastrointestinal tract by threefold compared to regular aspirin. Finding ways to complex lecithin to NSAIDs proved surprisingly challenging, especially for aspirin, which rapidly degrades in the presence of moisture. Each NSAID requires a unique formulation. The methods at PLx are more complex than enteric coatings now on the market, which only push NSAIDs farther down the gastrointestinal tract. The company plans to carry their NSAID products through the development stage, then seek commercialization partners. Risk Assessment Laboratories is searching for clinical applications for proteomics data. It has identified five biomarkers for preterm labor. One of the biomarkers is pre-B-cell colony elongation factor, a master regulator of birth. “We want to rationally target biomarkers related to a disease,” says Kevin Rosenblatt, M.D., Ph.D., director of R&D. Fetal fibronectin is an FDA-approved marker for preterm labor. However, its positive predictive value is so poor that many obstetricians do not bother measuring it in cervical fluid. The biomarker panel identified by Risk Assessment Laboratories requires only a few microliters of a woman’s peripheral blood. Because the biomarkers are linked to biological mechanisms of preterm labor, they could lead to better drugs to prevent or treat preterm labor. Risk Assessment Laboratories is developing protocols to measure biomarkers using selective reaction monitoring mass spectrometry. This reagent-free method detects proteins directly, is highly specific, and measures multiple markers. “Our goal is to build assays that can be done in any lab on readily available and easy-to-use mass spectrometers,” says Dr. Rosenblatt. PerkinElmer, a maker of fetal diagnostic tests, is funding the preclinical trials. Nano3D Biosciences sells the Bio-Assembler™ kit that grows three-dimensional (3-D) cells in 24 to 48 hours. 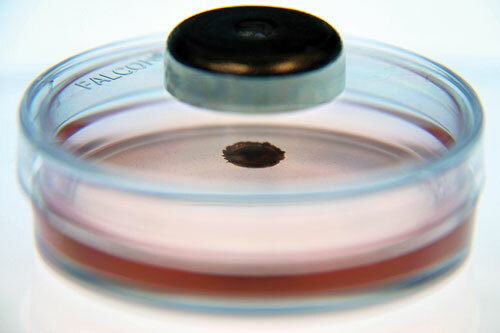 The cells are first tagged with magnetic nanoparticles, then levitated by a magnet field to grow in three dimensions, as described in Nature Nanotechnology in April 2010. This method for growing 3-D cell cultures is faster than competing products, which take weeks, according to the company. Standard tissue culture cells grow in flat two-dimensions, and “gene expression and signaling are different from that found in vivo,” says Glauco Souza, Ph.D., CSO. The Bio-Assembler allows co-culturing of different cell types, and it supports the growth of 25 different cell lines. Researchers can use the kit for basic research, drug discovery, toxicity testing, and stem cell and regenerative medicine. The starter Bio-Assembler kit contains a single microwell and a device that creates a magnetic field. A six-well plate system is undergoing beta testing, and a 96-well plate is in development. The 96-well format will support high-throughput screening and allow toxicity testing in cells that represent in vivo conditions. In the long-term, the technology could create 3-D tissue for regenerative medicine. “It all starts with a fundamental building block of a better representation of living tissue,” says David Lee, president and CEO. Nano3D Biosciences’ Bio-Assembler™ system cultures cells in three dimensions by magnetic levitation. The Bio-Assembler uses nanoparticle-based NanoShuttle-PL solution to deliver magnetic nanoparticles to cells. Magnetic drives then levitate cells to create the 3-D cell growth environment. Today’s researchers have many exciting new contrast agents to image biological events within cells, “but the instrumentation is lagging behind,” says Robert Kester, Ph.D., co-founder and CTO at Rebellion Photonics. Dr. Kester and colleagues developed a real-time hyper-spectral video camera that is compatible with all standard microscopes. Called the Arrow™, the camera views spectral signatures within cells and decouples them. Researchers can now track complex biological processes by visualizing up to 20 different dyes within a single cell. The commonly used fluoresent proteins, green fluorescent protein (FP), cyan FP, and yellow FP, all appear green under a microscope because their wavelengths differ by just a few nanometers. “Our system decouples multiplexed signals, and you can view them in real time,” says Dr. Kester. Researchers use the Arrow to understand how neurons fire and change with age and to find biomarkers for cancer and degenerative and infectious diseases. Endogenous signals such as autofluorescence can be isolated and removed to enhance quality. Images are obtained in a single snapshot, and the Arrow is more sensitive, faster, less phototoxic, and extends the life of cells compared to conventional scanning microscopy, according to Dr. Kester. GlycosBio leveraged technology from Rice University that uses microorganisms to convert nontraditional carbon sources, such as glycerol and fatty acids, into higher value chemicals. The company is focused on producing isoprene, 1,3 propane diol, and ethanol. When polymerized, isoprene can be turned into latex or automobile tires, and 1,3 propane diol into fibers for carpet or clothing. The company’s partners in other parts of the world “have lots of glycerol and want to make it into ethanol to build up a domestic supply,” says Paul Campbell, Ph.D., CSO. Malaysia’s palm oil industry produces glycerol as a byproduct, and GlycosBio is setting up a facility there to ferment it into ethanol. Closer to home, the company is looking for joint ventures to dispose of glycerol or fatty acids generated during biodiesel refining. Now considered waste products that are hauled away, GlycosBio plans to plug into a plant’s existing infrastructure to cost-effectively convert them to desirable products. 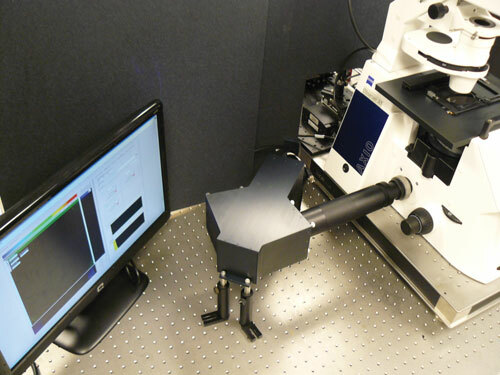 Rebellion Photonics’ Arrow real-time snapshot hyperspectral camera is shown mounted to the sideport of an inverted microscope.